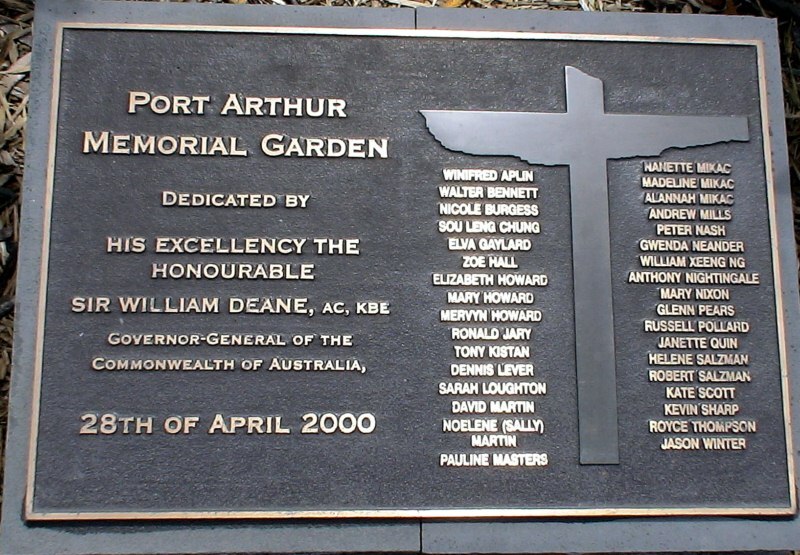 The Port Arthur massacre of 28–29 April 1996 was a mass shooting in which 35 people were killed and 23 wounded. 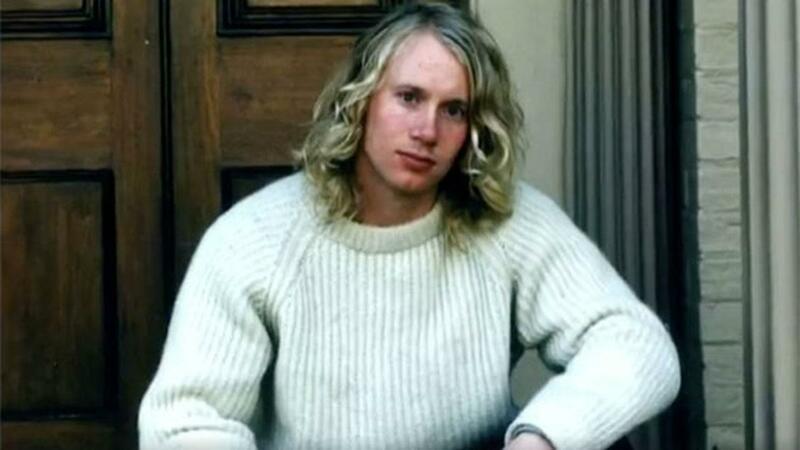 Martin Bryant was born on May 17, 1967, in Tasmania, Australia. Even as a child, he seemed odd, often detached from the people around him. Bryant found work as a handyman for Helen Harvey, a rich heiress to a lottery fortune. The two became close and there has been some speculation regarding the nature of their relationship. Whatever the case, she left Bryant her entire estate (about $570,000 in property and assets) after she died in a car accident in 1993. He was a passenger in the vehicle and some reports indicate that he was investigated as to whether he played a role in the crash. He used part of this money to go on many trips around the world from 1993 onwards. He is known to have visited Singapore, Bangkok, London, Sweden, Los Angeles, Frankfurt, Copenhagen, Sydney, Tokyo, Poland, and Auckland; some of these locations more than once, and the United Kingdom many times. Bryant also travelled all over Australia, making a vast number of interstate trips. On several occasions he made last-minute flight changes to destinations unknown. Bryant also withdrew many thousands of dollars during this period. Bryant also withdrew many thousands of dollars during this period. He used at least some of this money in late 1993 to purchase an AR-10 semi-automatic rifle through a newspaper advertisement in Tasmania. In March 1996, he had his AR-10 repaired at a gun shop. He made enquiries about AR-15 rifles in other gun shops. He later purchased an AR-15 from Terry Hill, a local gun shop owner. In April 1996, he also purchased cleaning kits for a .30 calibre weapon and 12 gauge shotgun. He purchased a sports bag and told a shop attendant that it would need to be strong enough to carry large amounts of ammunition, measured out with a tape measure. He told his girlfriend, Petra Wilmot, a different story about the purpose of the bag. He also hid the weapons and a large amount of ammunition at his house. His girlfriend was initially employed as a gardener by Bryant, and she never saw any weapons or ammunition in the house. 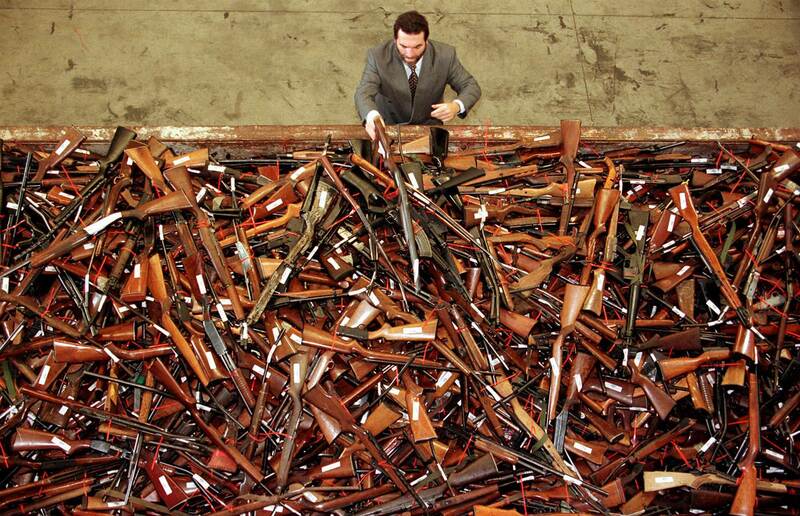 At the time of purchase, no registration of guns outside of handguns was required in Tasmania. Eventually his estate manager was forced to restrict his funds and Bryant stopped travelling frequently. With the money from Harvey’s estate, Bryant lived well, residing in a mansion in Hobart. Neighbours later reported that he threatened to shoot them if they trespassed on his property. He also kept a strange schedule of sleeping all day and wandering around outside at night. Several visitors to the home described it and its owner as "creepy." Bryant wasn’t far from the popular destination of Port Arthur, which houses the ruins of an old prison. In 1996, he began visiting the port in the months before the attack. Bryant's father had tried to purchase a bed and breakfast property called Seascape, but David and Noelene (also known as Sally) Martin bought this property before his father could ready his finances, much to the disappointment of the father who often complained to his son of the 'double dealing' the Martins had done to secure the purchase. 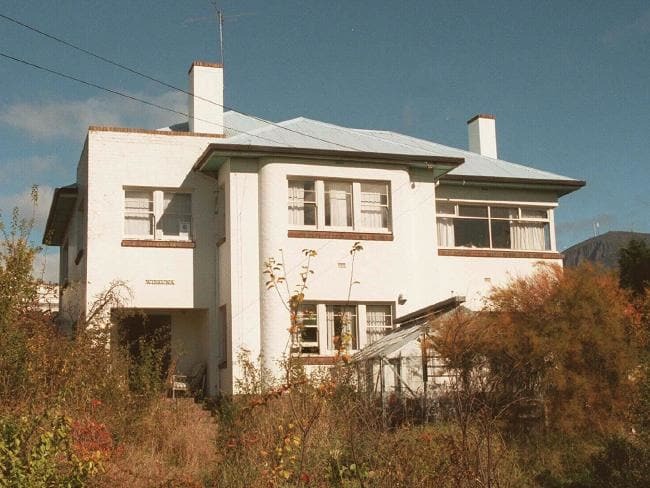 Bryant offered to buy another property from the Martins at Palmers Lookout Road, but they declined the offer. Bryant apparently believed the Martins had deliberately bought the property to hurt his family and believed this event to be responsible for the depression that led to his father's 1993 suicide, which in turn led to their own murders. Bryant described them as "very mean people" and as "the worse people in my life." Bryant’s father committed suicide under mysterious circumstances at the family’s home. He drowned himself wearing one of Bryant’s diving weight belts around his neck. Bryant reportedly showed little emotion over the loss of his father. On 28th April 1996 Bryant was awakened at 6:00 a.m. by his alarm clock. His girlfriend and other family members said he had never been known to use it since he did not work and had no other commitments. At 8:00 a.m., his girlfriend left the house to visit her parents. Bryant left the house and switched on the burglar alarm, which registered the time as 9:47 a.m. Bryant travelled to Forcett Village, arriving some time around 11:00 a.m. He continued down to Port Arthur and was seen driving into Seascape down the Arthur Highway around 11:45 a.m. He stopped at the Seascape guest accommodation site that his father had wanted to purchase, owned by David and Noelene Martin. Bryant went inside and fired several shots, then gagged David Martin and stabbed him. Witnesses testified to different numbers of shots fired at this time. 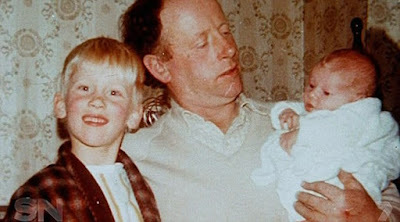 It was stated in court that it was believed that this was the time that Bryant killed the Martins, his first two victims. A couple stopped at Seascape and Bryant met them outside. 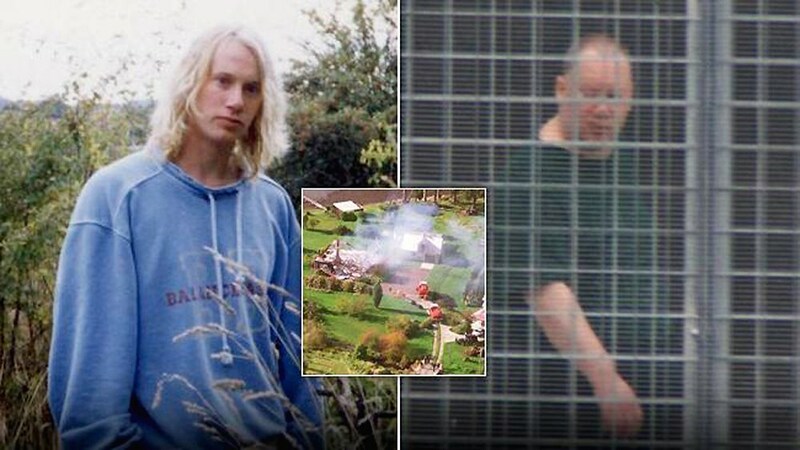 When they asked if they could have a look at the accommodation, Bryant told them that they could not because his parents were away and his girlfriend was inside. His demeanour was described as quite rude and the couple felt uncomfortable. They left at about 12:35 p.m. Bryant's car was seen reversed up to the front door. It is assumed he unloaded ammunition. Bryant drove to Port Arthur, taking the keys to the Seascape properties after locking the doors. Bryant stopped at a car which had pulled over from overheating and talked with two people there. 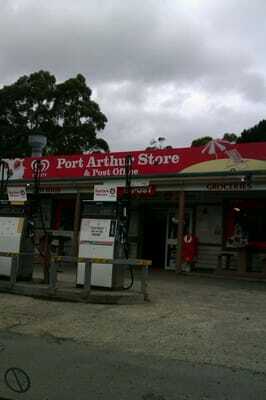 He suggested that they come to the Port Arthur café for some coffee later. He travelled past the Port Arthur historic site toward a Palmer's Lookout Road property owned by the Martins, where he came across Roger Larner driving out of his driveway. Larner had met him on some occasions more than 15 years before, but did not initially recognise him. Bryant told Larner he had been surfing and had bought a property called Fogg Lodge and was now looking to buy some cattle from Larner. Bryant also made several comments about buying the Martins' place next door. He asked if Marian Larner was home, and asked if he could continue down the driveway of the farm to see her. Larner said OK, but told Bryant he would come also. Bryant changed his mind and left, claiming he was going to return in the afternoon. At around 1:10 p.m., Bryant got in line at the toll booth at the entrance to the historic site. Upon getting close to the toll booth, he left the line and moved to the back again. Eventually getting to the front of the line, he claimed someone had almost reversed into him. He paid the entry fee and proceeded to park near the Broad Arrow Café, near the water's edge. The site security manager told him to park with the other cars because that area was reserved for camper-vans and the car park was very busy that day. Bryant moved his car to another area and sat in his car for a few minutes. He then moved his car back near the water, outside the café. The security manager saw him go up to the café carrying a large bag and a video camera, but ignored him. Bryant went into the café and purchased a meal, which he ate on the deck outside. He attempted to start conversations with people about the lack of "wasps" in the area and there not being as many Japanese tourists as usual, but he seemed to be mainly mumbling to himself. He appeared nervous and continually looked back to the car-park and into the café. Bryant finished his meal, walked into the café and returned his tray, assisted by some people who opened the door for him. He put his bag down on a table and pulled a Colt AR-15 SP1 Carbine with a Colt scope and one 30-round magazine attached out of the bag. He left the bag which contained, among other things, the knife with which he had stabbed Martin, on the table. It is believed the magazine was partially emptied from the shootings at Seascape. The café was very small, with the tables very close together, and was particularly busy that day, with many people waiting for the next ferry. The following events happened extremely quickly. Bryant took aim from his hip and pointed his rifle at Moh Yee (William) Ng and Sou Leng Chung, who were visiting from Malaysia, who were at a table beside Bryant. He shot them at close range, killing both instantly. Bryant then fired a shot at Mick Sargent, grazing his scalp and knocking him to the floor. He fired a fourth shot that killed Sargent's girlfriend, 21-year-old Kate Elizabeth Scott, by hitting her in the back of the head. A 28-year-old New Zealand winemaker, Jason Winter, had been helping the busy café staff. As Bryant turned towards Winter's wife Joanne and their 15-month-old son Mitchell, Winter threw a serving tray at Bryant in an attempt to distract him. Joanne Winter's father pushed his daughter and grandson to the floor and under the table. 44-year-old Anthony Nightingale stood up after the sound of the first shots, but had no time to move. Nightingale yelled "No, not here!" as Bryant pointed the weapon at him. As Nightingale leaned forward, he was fatally shot through the neck and spine. The next table had held a group of ten friends, but some had just left the table to return their meal trays and visit the gift shop. Bryant fired one shot that killed Kevin Vincent Sharp, 68. The second hit Walter Bennett, 66, passed through his body and struck Raymond John Sharp, 67, Kevin Sharp's brother, killing both. The three had their backs towards Bryant, and were unaware what was happening. They at first believed someone was letting off firecrackers. One of them made the comment "That's not funny" after hearing the first few shots, not realising that they were real. The shots were all close range, with the gun at, or just inches away from, the back of their heads. Gerald Broome, Gaye Fidler and her husband John were all struck by bullet fragments, but survived. Bryant then turned towards Tony and Sarah Kistan and Andrew Mills. Both men stood up at the noise of the initial shots, but had no time to move away. Andrew Mills was shot in the head. Tony Kistan was also shot from about two metres away, also in the head, but had managed to push his wife away prior to being shot. Sarah Kistan was apparently not seen by Bryant, as she was under the table by that time. Thelma Walker and Pamela Law were injured by fragments before being dragged to the ground by their friend, Peter Crosswell, as the three sheltered underneath the table. Also injured by fragments from these shots was Patricia Barker. It was only then that the majority of the people in the café began to realise what was happening and that the shots were not from a reenactment at the historical site. At this point, there was great confusion, with many people not knowing what to do, as Bryant was near the main exit. Bryant moved just a few metres and began shooting at the table where Graham Colyer, Carolyn Loughton and her daughter Sarah were seated. Colyer was severely injured in the jaw, nearly choking to death on his own blood. 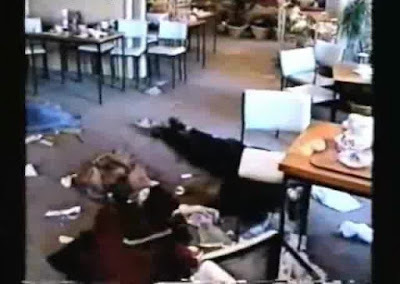 Sarah Loughton ran towards her mother, who had been moving between tables. Carolyn Loughton threw herself on top of her daughter. Bryant shot Carolyn Loughton in the back; her eardrum was ruptured by the muzzle blast from the gun going off beside her ear. She survived her injuries, but learned after she came out of surgery that, despite her efforts, Sarah had been fatally shot in the head. Bryant pivoted around and shot Mervyn Howard who was seated. The bullet passed through him, through a window of the café, and hit a table on the outside balcony. Bryant quickly followed up with a shot to the neck of Mervyn Howard's wife, Mary. Bryant then leaned over a vacant baby stroller and pointed the gun at her head and shot her a second time. Both of the Howards' injuries were fatal. Bryant was near the exit, preventing others from attempting to run past him and escape. Bryant moved across the café towards the gift shop area. There was an exit door through the display area to the outside balcony, but it was locked and could only be opened with a key. As Bryant moved, Robert Elliott stood up. He was shot in the arm and head, left slumping against the fireplace but alive. All of these events, from the first bullet that killed Ng, took approximately 15–30 seconds, during which twelve people were killed and ten more wounded. Bryant moved toward the gift shop area, giving many people time to hide under tables and behind shop displays. He fatally shot the two local women who worked in the gift shop - 17-year-old Nicole Burgess in the head, and 26-year-old Elizabeth Howard in the arm and chest. Coralee Lever and Vera Jary hid behind a hessian screen with others. Lever's husband Dennis was fatally shot in the head. Pauline Masters, Vera Jary's husband Ron, and Peter and Carolyn Nash had attempted to escape through a locked door but could not. Peter Nash lay down on top of his wife to hide her from Bryant. Bryant moved into the gift shop area where several people, trapped with nowhere to go, were crouched down in the corners. Gwen Neander, trying to escape through the door, was shot in the head and killed. Bryant saw movement in the café and moved near the front door. He shot at a table and hit Peter Crosswell, who was hiding under it, in the buttock. Jason Winter, hiding in the gift shop, thought Bryant had left the building and made a comment about it to people near him before moving out into the open. Bryant saw him, with Winter stating "No, no" just prior to being shot, the bullet hitting his hand, neck and chest. A second shot to the head proved fatal to Winter. Fragments from those shots struck American tourist Dennis Olson, who had been hiding with his wife Mary and Winter. Dennis Olson suffered fragment injuries to his hand, scalp, eye and chest, but survived. It is not immediately clear what happened next, although at some point, Bryant reloaded his weapon. Bryant walked back to the café and then returned to the gift shop, this time looking down to another corner of the shop where he found several people hiding in the corner. He walked up to them and shot Ronald Jary through the neck, then Peter Nash and Pauline Masters, killing all three. He did not see Carolyn Nash, who was lying under her husband. Bryant aimed his gun at an unidentified Asian man, but the rifle's magazine was empty. Bryant then quickly moved to the gift shop counter, where he reloaded his rifle, leaving an empty magazine on the service counter, and left the building. Twenty-nine rounds had been fired in the café and gift shop areas in approximately 90–120 seconds. Up to this time, Bryant had killed 22 people and injured 12. During the café shooting, some staff members had been able to escape through the kitchen and alerted people outside. There were a number of coaches outside with lines of people, many of whom began to hide in the buses or in nearby buildings. Others did not understand the situation or were unsure where to go. Some people believed there was some sort of historical reenactment happening, and moved towards the area. 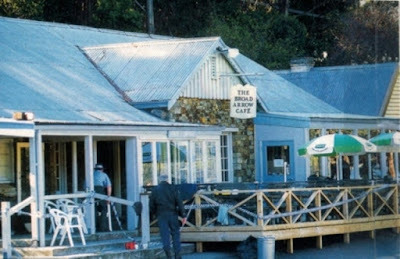 Ashley John Law, a site employee, was moving people away from the café into the information centre when Bryant fired at him from 50–100 metres (50–110 yards) away. The bullets missed Law and hit some trees nearby. Bryant then moved towards the coaches. One of the coach drivers, Royce Thompson, was shot in the back as he was moving along the passengers' side of a coach. He fell to the ground and was able to crawl, then roll under the bus to safety, but later died of his wounds. Brigid Cook was trying to guide a number of people down between the buses and along the jetty area to cover. Bryant moved to the front of this bus and walked across to the next coach. People had quickly moved from this coach towards the back end, in an attempt to seek cover. 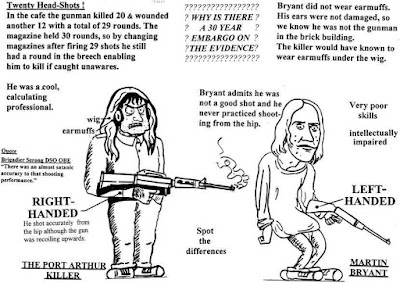 As Bryant walked around it, he saw people scrambling to hide and shot at them. Brigid Cook was shot in the right thigh, causing the bone to fragment, the bullet lodging there. A coach driver, Ian McElwee, was hit by fragments of Miss Cook's bone. Both were able to escape and survived. Bryant then quickly moved around another coach and fired at another group of people. Winifred Aplin, running to get to cover behind another coach, was fatally shot in the side. Another bullet grazed Yvonne Lockley's cheek, but she was able to enter one of the coaches to hide, and survived. Some people then started moving away from the car park towards the jetty. But someone shouted that Bryant was heading that way, so they tried to double back around the coaches to where Brigid Cook had been shot. Bryant doubled back to where Janet and Neville Quin, who owned a wildlife park on the east coast of Tasmania, were beginning to move toward Mason Cove and away from the buses. Bryant shot Janet Quin in the back, where she fell, unable to move, near Royce Thompson. Bryant then continued along the car park as people tried to escape along the shore. Doug Hutchinson was attempting to get into a coach when he was shot in the arm. He quickly ran around the front of the coach, and then along the shore to the jetty and hid. 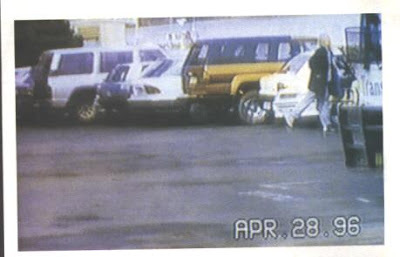 Bryant then went to his vehicle, which was just past the coaches, and changed weapons to the self loading rifle. He fired at Denise Cromer, who was near the penitentiary ruins. Gravel flew up in front of her as the bullets hit the ground. Bryant then got in his car and sat there for a few moments before getting out again and going back to the coaches. Some people were taking cover behind cars in the car park, but because of the elevation, Bryant could see them and the cars did not provide much cover. When they realized Bryant had seen them, they ran into the bush. He fired several shots. At least one hit a tree behind which someone was taking cover, but no one was hit. Bryant moved back to the buses where Janet Quin lay injured from the earlier shot. Bryant shot her in the back, then left; she later died from her wounds. Bryant then went onto one of the coaches and fired a shot at Elva Gaylard who was hiding inside, hitting her in the arm and chest and killing her. At an adjacent coach, Gordon Francis saw what happened and moved down the aisle to try to shut the door of the coach he was on. He was seen by Bryant and shot from the opposite coach. He survived, but needed four major operations. Neville Quin, husband of Janet, had escaped to the jetty area, but returned to look for his wife. He had been forced to leave her earlier after Bryant shot her. Bryant exited the coach and, spotting Quin, chased him around the coaches. Bryant fired at him at least twice before Quin ran onto a coach. Bryant entered the coach and pointed the gun at Neville Quin's face, saying, "No one gets away from me". Mr Quin ducked when he realised Bryant was about to pull the trigger. The bullet missed his head but hit his neck, momentarily paralysing him. 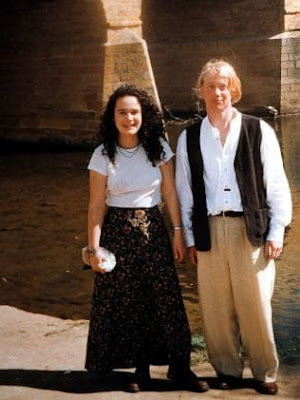 After Bryant left, Quin managed to find his wife, although she later died in his arms. Neville Quin was eventually taken away by helicopter and survived. Bryant fired at James Balasko, a U.S. citizen, hitting a nearby car. Balasko had been attempting to film the shooter. Many people, unable to use their parked cars, were hiding or running along Jetty Road and did not know where Bryant was because the gunfire was extremely loud and difficult to pinpoint. It was not clear that Bryant was mobile, nor was it even clear from which direction the shots were coming. At this time, Bryant had killed 26 people and injured 18. Bryant then got back into his car and left the car park. Witnesses say he was sounding the horn and waving as he drove. Bryant drove along Jetty Road towards the toll booth where a number of people were running away. Bryant passed by at least two people. Ahead of him were Nanette Mikac and her children, Madeline, 3, and Alannah, 6. Nanette was carrying Madeline, and Alannah was running slightly ahead. By this point, they had run approximately 600 metres (660 yd) from the car park. Bryant opened his door and slowed down. Mikac moved towards the car, apparently thinking he was offering them help in escaping. Several more people witnessed this from further down the road. Someone recognised him as the gunman and yelled out "It's him!" Bryant stepped out of the car, put his hand on Nanette Mikac's shoulder and told her to get on her knees. She did so, saying, "Please don't hurt my babies". Bryant shot her in the temple, killing her. Next, he fired a shot at Madeline, which hit her in the shoulder, then shot her fatally through the chest. Bryant shot twice at Alannah, as she ran behind a tree, missing. He then walked up, pressed the barrel of the gun into her neck and fired, killing her instantly. Bryant fired at some people hiding in a bush, but missed. Having seen the murders of the children, some people further up the road began running. They told drivers of cars coming down the road to go back. The people thought Bryant would head up the road, so instead they proceeded on foot down a dirt side road and hid in the bush. The cars reversed up the road to the toll booth. Bryant drove up to the toll booth, where there were several vehicles, and blocked a BMW owned by Mary Rose Nixon. Inside were Nixon, driver Russell James Pollard and passengers Helene and Robert Graham Salzmann. An argument with Robert Salzmann ensued, and Bryant took out his rifle and shot Salzmann at point-blank range, killing him. Pollard emerged from the BMW and went towards Bryant, who shot him in the chest, killing him. More cars then arrived, but seeing this, the drivers were quickly able to reverse back up the road. Bryant then moved to the BMW and pulled Nixon and Helene Salzmann from the car and shot them dead, dragging their bodies onto the road. Bryant transferred ammunition, handcuffs, the AR-15 rifle and a fuel container to the BMW. Mary Nixon, Russell Pollard, Helene Salzmann and Robert Salzmann are the people Bryant was charged with killing at the toll booth. Another car then came towards the toll booth and Bryant shot at it. The driver, Graham Sutherland, was hit with glass. A second bullet hit the driver's door. Sutherland quickly reversed back up the road and left. 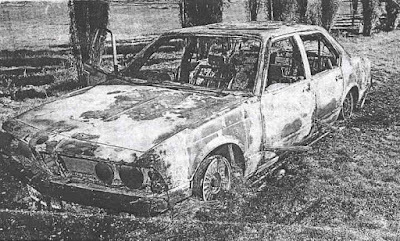 Bryant then got into the BMW, leaving behind his Volvo 244, including his Daewoo shotgun and hundreds of rounds of ammunition. At this point, Bryant had killed 33 and injured 19. 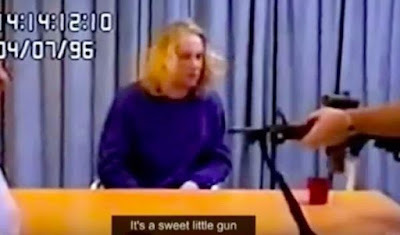 Graham Sutherland, who had just been shot at in his car, reversed back up the road and drove to the service station close by, where he tried to inform people what was happening. Bryant drove up to the service station and cut off a white Toyota Corolla that was attempting to exit onto the highway. Glenn Pears was driving, with girlfriend Zoe Hall in the passenger seat. Bryant quickly exited the car with his rifle in hand and tried to pull Hall from the car. Pears got out of the car and approached Bryant. Bryant pointed the gun at Pears and pushed him backwards, eventually directing him into the now open boot of the BMW, locking Pears inside. Bryant then moved back to the passenger side of the Corolla as Hall attempted to climb over to the driver's seat. Bryant raised his rifle and fired three shots, killing her. Many people around the service station witnessed this and ran to hide in nearby bushland. The service station attendant told everyone to lie down and he locked the main doors. He grabbed his rifle, but by the time he could retrieve some ammunition and load his gun, Bryant had left in the BMW. A police officer arrived several minutes later and then set out in pursuit of Bryant. Zoe Hall was the 34th victim killed. As Bryant drove down to Seascape, he shot at a red Ford Falcon coming the other way, smashing its front windscreen. Upon arriving at Seascape, he got out of his car. A Holden Frontera 4WD vehicle then approached Seascape along the road. Those in the vehicle saw Bryant with his gun, but believed him to be rabbit hunting and actually slowed down as they passed him. Bryant fired into the car; the first bullet hit the bonnet and broke the throttle cable. He fired at least twice more into the car as it passed, breaking the windows. One bullet hit the driver, Linda White, in the arm. The car was going downhill so it was able to roll down the road out of sight around a corner. White swapped seats with her boyfriend, Michael Wanders, who attempted to drive the car, but was unable to, because of the broken throttle cable. Another vehicle then drove down the road, carrying four people. It was not until they were almost adjacent to Bryant that they realised he was carrying a gun. Bryant shot at the car, smashing the windscreen. Douglas Horner was wounded by pieces of the windscreen. The car proceeded ahead where White and Wanders tried to get in, but Horner did not realise the situation and drove on. When they saw that White had been shot, they came back and picked them up. Both parties then continued down to a local establishment called the Fox and Hound, where they called police. Yet another car drove past and Bryant shot at it, hitting the passenger, Susan Williams, in the hand. The driver, Simon Williams, was struck by fragments. The driver of another approaching vehicle saw this and reversed back up the road. Bryant also fired at this car, hitting it but not injuring anyone. Bryant then got back into the BMW and drove down the Seascape driveway to the house where the Martins, his first victims, lay dead. Sometime after he stopped, Bryant removed Pears from the boot and handcuffed him to a stair rail within the house. At some point, he also set the BMW on fire. He is believed to have arrived at the house by about 2:00 p.m. The only two police officers stationed on the peninsula (at Nubeena and Dunalley) were attending an emergency call that turned out to be fake at Saltwater River when they received a radio message at 1:32 p.m. to attend Port Arthur and be on the look out for a yellow Volvo. They headed to Port Arthur in different cars and taking different routes. On the way, they were informed to look for a BMW and eventually they were informed of people at the Fox and Hound who had been shot. One police officer then drove down the road past Seascape and past the disabled car of Linda White. He looked at it for a moment and continued down to the Fox and Hound. After he informed his partner, they proceeded back to Seascape. At about 2:00 p.m., they were back at Seascape and could see the BMW on fire. At some point, they were fired upon, and eventually had to hide in a ditch at the side of the road. Bryant fired at them whenever they tried to escape, and they were not able to move from that position for many hours. At around 2:10 p.m., Bryant received a call from a woman from the ABC who had been ringing local businesses randomly trying to receive information about what was occurring. Bryant claimed his name was Jamie, and when she asked what was happening he replied "Lots of fun". Bryant then told her that if she phoned him again, he would shoot Glenn Pears. At about 3:00 p.m., shortly after forcing a group of police officers to take cover in a ditch, Bryant rang the local police station. The wife of one of the police officers answered the phone. Bryant asked who she was and if she knew where her husband was. He again called himself Jamie. He asked if she knew whether or not her husband was okay, and when she did not answer, Bryant then told her he was okay and that he knew where her husband was. Around 9:00 p.m. the Police Special Operations Group (SOG) had arrived and were eventually able to assist in extracting the policemen from the ditch to safety under cover of darkness, riot shields and bulletproof jackets. They did not provide cover fire for fear of hitting hostages. An 18-hour standoff ensued during which time the police talked over the phone to Bryant, still calling himself Jamie. He requested a helicopter, saying that he wanted to be flown to a plane and then on to Adelaide, South Australia. He said that if the helicopter arrived, he would release Pears and only keep Noelene Martin. Bryant could see the movements of SOG officers, and continually demanded their retreat each time they began to approach the house. As he appeared to have excellent awareness of the events unfurling around him, despite the pitch black of night, the police believed he had some kind of visual aid device; none was ever found, however. A man was spotted on the roof of an adjacent building at one point, believed to be Bryant. Later in the night, the cordless phone Bryant was using began to run low on batteries. Police tried unsuccessfully to get him to return the phone to the charger, but it went dead and there were no further communications. Bryant was captured the following morning, when a fire started in the guest house, presumably set by Bryant. Bryant taunted police to "come and get him", but the police, believing the hostage was already dead, decided that the fire would eventually bring Bryant out. A large amount of ammunition had also ignited and was exploding sporadically as the house burned. Bryant eventually ran out of the house with his clothes on fire, suffering burns to his back and buttocks. He was promptly arrested and taken to hospital for treatment. It was discovered that Glenn Pears had been shot during or before the standoff and had died before the fire. The remains of the Martins were also found. It was also determined they had been shot, and that Noelene Martin had suffered blunt-force trauma. 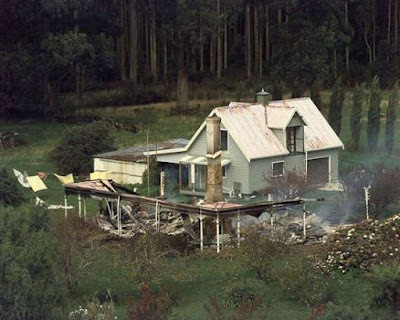 They both died before the fire; witness accounts of the gunfire, as presented to the Supreme Court of Tasmania, place the time of death of David and Noelene Martin as being approximately noon on 28 April. One weapon was found burnt in the house, and the other on the roof of the adjacent building where police believed they had seen Bryant the night before. Both weapons had suffered from massive chamber blast pressure, possibly from the heat of the house fire. Bryant was held in Royal Hobart Hospital under heavy police guard while awaiting trial. According to a police officer tasked with guarding him, at least two would-be vigilantes made unsuccessful applications to hospital security staff in an attempt to exact revenge. In his police interview, Bryant admitted to having carjacked the BMW, but claimed it only had three occupants and denied shooting any person. He also claimed he did not take the BMW from the vicinity of the toll booth and that his hostage was taken from the BMW. He said that he thought the man he took hostage must have died in the boot when the car exploded. He did not distinguish between the car fire and the later house fire. He also denied visiting Port Arthur on that day, despite vague identification by several people, including the toll attendant, of a man matching a similar description being at the diner. Such discrepancies indicate that Bryant was either lying during the police interview or was mentally incapable of recalling events accurately. Bryant also claimed that the guns found by police were not his, but admitted to owning the shotgun that was found with his passport back in his own car near the toll booth. Initially Bryant pleaded not guilty to the 35 murders and did not provide a confession. However, Bryant changed his plea to guilty for a court hearing on 19 November 1996, where he was found guilty of all charges. The judge then ordered that all evidence for the case be sealed. On 22 November, Bryant was sentenced to 35 sentences of life imprisonment for each count of murder and sentenced to 25 years for the remaining 36 charges on 5 other offences (20 attempted murders, 3 counts infliction of grievous bodily harm, the infliction of wounds upon a further 8 persons, 4 counts of aggravated assault and 1 count of unlawfully setting fire to property). All sentences are to be served concurrently in Hobart's Risdon Prison where he remains in solitary confinement, and is not permitted any visitors other than his immediate family. His prison papers indicate that he is never to be released, and he continues to serve his term without possibility of parole. This is very rare in Australia, where the majority of murder sentences allow for the possibility of parole after a long prison term. Australians reacted to the event with widespread shock and horror, and the political effects were significant and long-lasting. 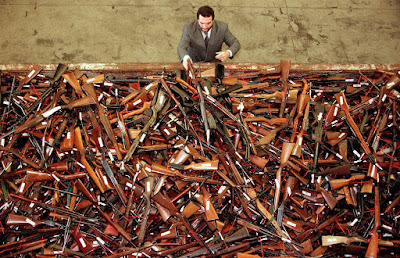 The federal government led state governments, some of which (notably Tasmania itself and Queensland) were opposed to new gun laws, to severely restrict the availability of firearms. Concern was raised within the Coalition Government that fringe groups such as the 'Ausi Freedom Scouts', the Australian League of Rights and the Citizen Initiated Referendum Party, were exploiting voter anger to gain support. After discovering that the Christian Coalition and US National Rifle Association were supporting the gun lobby, the government and media cited their support, along with the moral outrage of the community to discredit the gun lobby as extremists. Much discussion has occurred as to the level of Bryant's mental health. It is generally accepted that he has a subnormal IQ (estimated at 66, and in the lowest 2% of his age group) and at the time of the offences was in receipt of a Disability Support Pension on the basis of being mentally handicapped. Reports that he had schizophrenia were based on his mother's misinterpretation of psychiatric advice; Bryant had never been diagnosed with schizophrenia, nor any major depressive disorder. Media reports also detailed his odd behaviour as a child. However, he was able to drive a car and obtain a gun, despite lacking a gun licence or a driver's licence. This was a matter which, in the public debate that followed, was widely regarded as a telling demonstration of the inadequacy of the nation's gun laws. Bryant's motivation for the massacre remains a closely guarded secret, known only to his lawyer, who is bound not to reveal confidences without his client's consent. 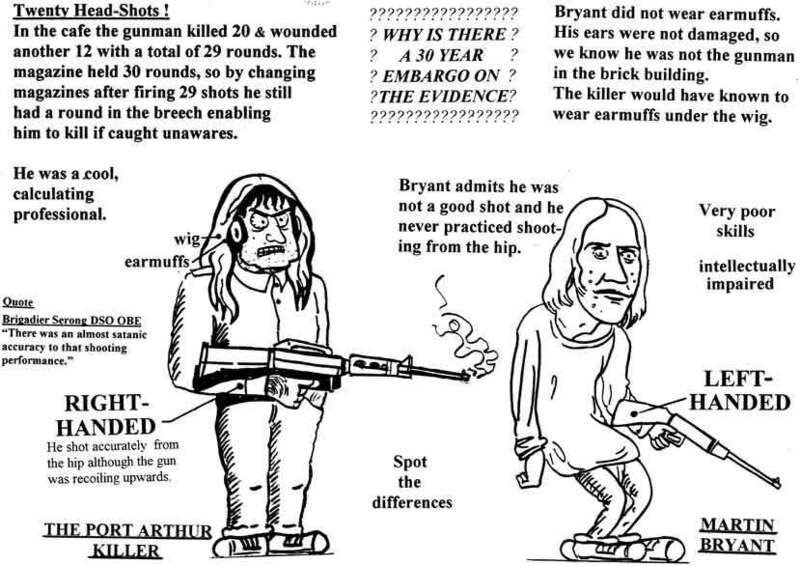 The lawyer later released a book outlining that Bryant was motivated largely by the media reports of the then-recent Dunblane school massacre. From the moment he was captured, he continually wanted to know how many people he had killed and seemed impressed by the number. Bryant is only allowed to listen to music on a radio outside his cell, and is denied access to any news reports of his massacre. Photographers allowed in to take pictures of him in his prison cell were forced to destroy the film in his presence when the Governor found out. 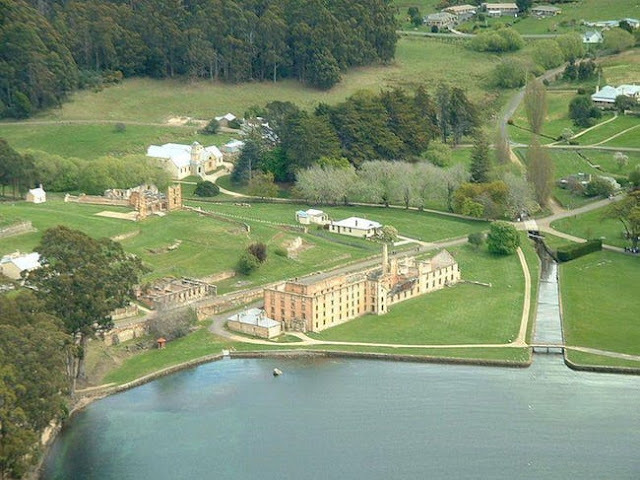 The Port Arthur tourist site reopened a few weeks later, and since then a new restaurant has been built. The former Broad Arrow Café structure is now a 'place for quiet reflection', with a monument and memorial garden dedicated at the site in April 2000. The Australian Journal of Emergency Management published several research articles on the response and the ongoing processes of recovery, including an article about caring for the social workers working with residents. The massacre at Port Arthur created a kinship with the Scottish town of Dunblane, which had suffered a similar event, the Dunblane school massacre, only weeks previously. 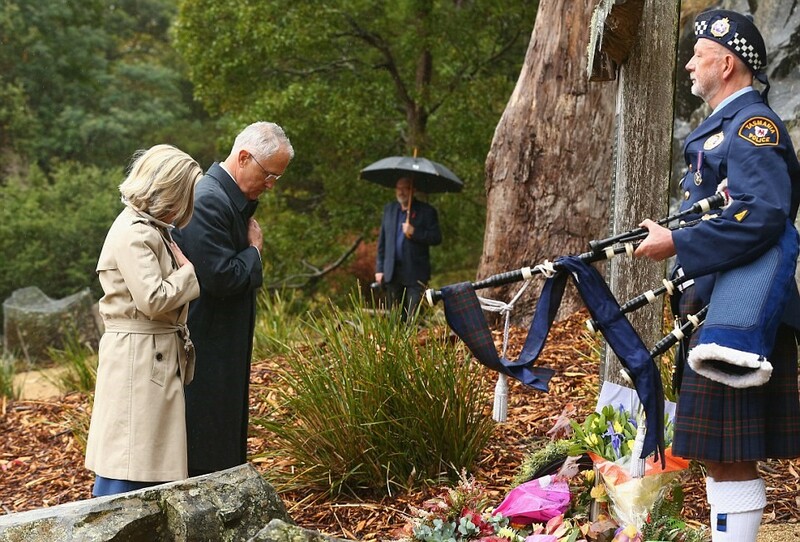 The two communities exchanged items to place at their respective memorials. 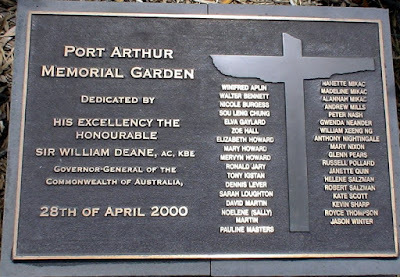 In 1996, Australian composer Peter Sculthorpe wrote Port Arthur, In memoriam: for chamber orchestra, "...for the victims of the massacre at Port Arthur, April 28, 1996, for those who died, and for those who live with the memory of it." 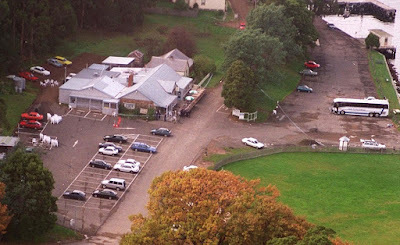 The work was first performed 24 June 1996, at Government House, Hobart, Tasmania, by the Tasmanian Symphony Orchestra conducted by David Porcelijn. In 2007, Tasmanian playwright Tom Holloway dealt with the massacre in his play Beyond the Neck. Tasmanian composer Matthew Dewey also deals with these issues in his first symphony. At least two conspiracy theories about the massacre have been promoted. The most prominent advocate of conspiracy theories was Joe Vialls, who asserted that Bryant was framed by one or more people who were actually the shooters. A range of theories were posed by some opponents of gun control, suggesting that the gun control lobby staged the massacre in order to gain public support for gun control laws. For example, the militia organisation Australian Freedom Scouts argued that Bryant did not have the requisite weapons proficiency to carry out the massacre. One theory compared the massacre with the assassination of President of the United States John F. Kennedy. These alternative theories have generally been dismissed as without foundation by the mainstream media and the authorities. The Government of Tasmania, the Tasmania Police, the prosecutor Damian Bugg and Bryant's own defence lawyer John Avery have all dismissed the suggestion that Bryant was not acting alone, saying that the evidence simply does not support any of the conclusions reached by the theorists. 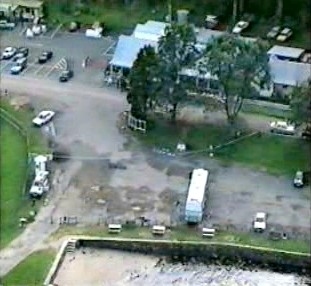 In 2001, One Nation leader Pauline Hanson caused controversy when she claimed that the Commonwealth had ruled out "a full investigation" when "a lot of people are asking questions" about Port Arthur. The Sporting Shooters' Association of Australia rejected all conspiracy theories surrounding the massacre, stating that the claims were "ludicrous," and urged One Nation to change their position or risk being seen as influenced by extreme elements within the community.